This week, the 2019 IIHF Women’s World Championship will start up in Espoo, Finland. It’s the first World Championship being held in Finland since 2009. To give some insider perspective on the tournament, the country of Finland, and Finnish women’s hockey, At Even Strength sat down with three members of the Finnish women’s national team: forward Venla Hovi, forward Emma Nuutinen, and defender Minttu Tuominen. Hovi spent the past year with the Calgary Inferno of the Canadian Women’s Hockey League, and became the first Finnish player to win the Clarkson Cup. 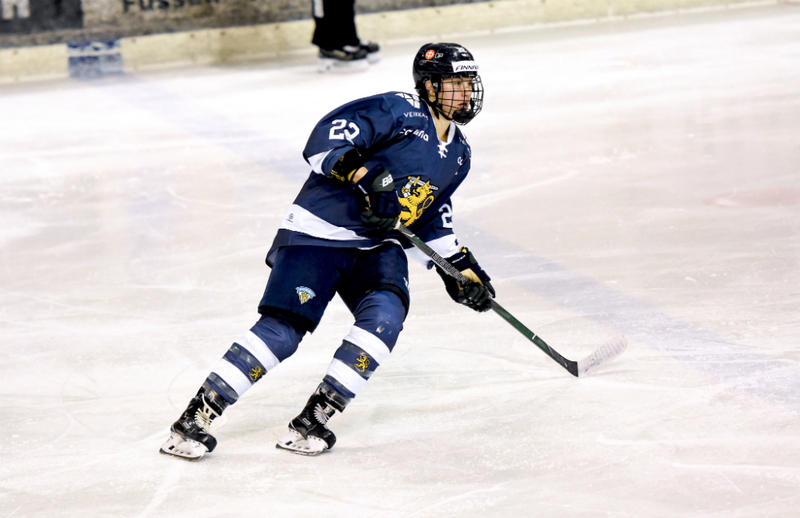 Nuutinen just finished her junior year with Mercyhurst University in the NCAA, and was named the Most Outstanding Player of the College Hockey America playoffs last season. Tuominen is the captain of the Espoo Blues in the Naisten Liiga, and helped the Blues win the Aurora Borealis Cup as league champions a couple of weeks ago. What is your favorite hockey memory from growing up in Finland? Hovi: Honestly questions like that are so hard. It would be really hard for me to say just one memory but I think it’s the overall picture of actually skating outside every day for hours after school. Just outdoor rinks and playing and getting all the neighbors from different houses and apartments to come together to the rink and just playing. And then my mom and dad having to carry me home at night. 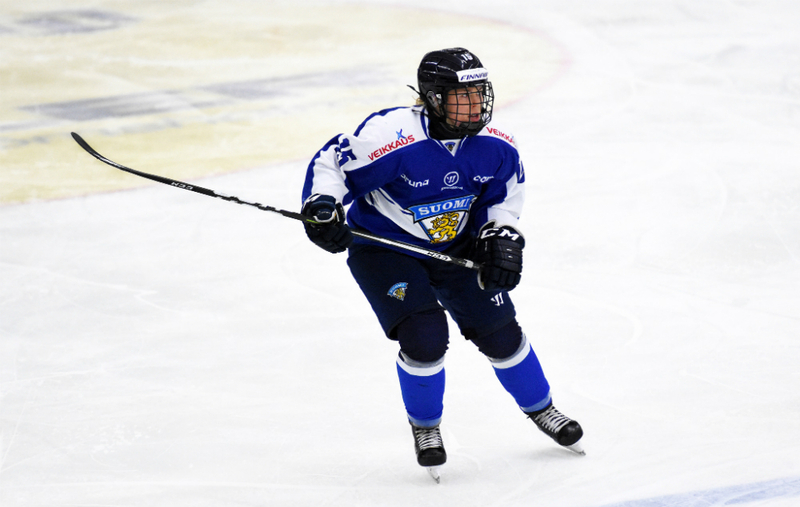 Nuutinen: I would say I played with boys until I was 16 and after that, when I switched to [a] women’s team, the Espoo Blues, our first Finnish championship was really cool. And the women’s team and women’s league was a whole different world from boys’ hockey. So the first Finnish championship was really cool. Tuominen: This is a tough one. I don’t know, maybe just because I didn’t start playing hockey until I was 12 or 13 but me and my brother, he’s two years older than me and we always used to play hockey and floorball and all these games like in our backyard or in our basement. So probably that from when I was a lot younger. What’s your favorite moment or memory with the national team? Hovi: There’s so many good moments. I’m going with a little bit different answer because there’s so many good memories, it’s hard to pick just one. So I’m going to go with the hardest, of losing against Sweden in Sochi in the quarterfinals. And I think how we went to the very low bottom at that point with our emotions and whatever, but then the team kind of handled it all together so well and I feel like we improved and have come a long way since then, all the way to how we played in PyeongChang and growing together. I would say that would be one of my favorite memories. Nuutinen: Last year’s Olympic bronze. It’s my favorite memory. Tuominen: Winning bronze at Vancouver and Pyeongchang, definitely. Hovi: Honestly, when I hear the word, obviously the first thing that comes to my mind is our national team. And like sports in general. Because I think there’s probably so many different definitions to it but it’s something, some kind of determination that can’t be explained, like it goes beyond. And I feel like the roots come from the Finnish history. So whoever’s from Finland would kind of know the history and how Finland has had to battle to become what the country is right now. But I think you can see it in all sorts of sports where we don’t have a lot of people in Finland but we can still succeed with the determination and the willpower of a team or an individual athlete, for example. Nuutinen: Hard-working, determination, and passion. Tuominen: It means like keeping going even though you can’t feel your legs and your lungs are burning and even if it’s like a tough situation. The mental part too. What are you most excited for about Worlds being in Finland? Hovi: I think I’m the most excited about seeing the difference between when I played in Finland in the Worlds in 2009. I don’t remember a lot from there but just kind of seeing the difference because it has grown so much. I feel like that’s going to be a different atmosphere and I feel like people know lots more about our team, and there’s going to be a lot of support and all the rest of it. So I hope that growth is going to show and give us a lot of energy. Nuutinen: Well, I’ve been playing in the United States for three years and my parents, they haven’t seen me play. The rink is 20 minutes away from our house, so my parents, my family, my friends, they can all come and see me playing. 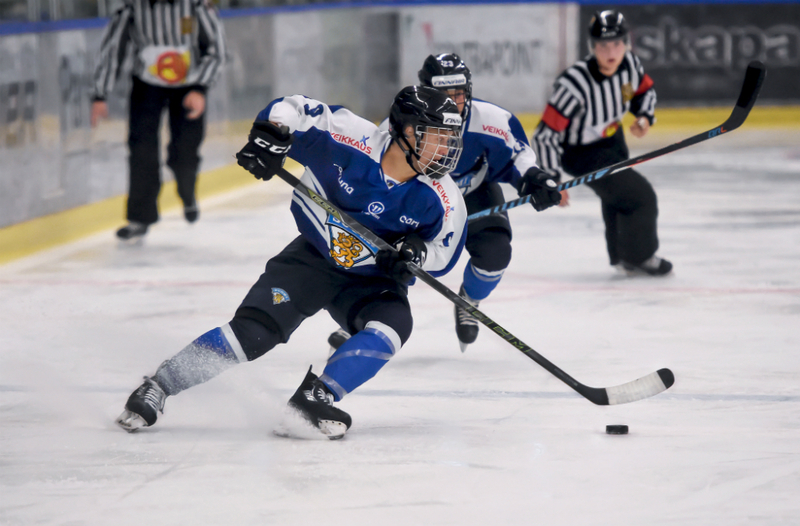 Tuominen: Definitely playing in basically home ice and just having so many people I know just watching me play with the national team for Finland. So I don’t know, it’s just a huge honor and doing it on home ice is probably something I will never forget. Who is someone who inspires you back home in Finland? Hovi: Back home in Finland…my hockey idol growing up was Saku Koivu. He was the one who I followed growing up and used to watch his games. Always on outdoor rinks I wanted to be him because I didn’t know any female players. I didn’t know that female players existed. So he was the one growing up and I think as for right now, I think she’s actually not in Finland, she’s in Sweden [playing professional hockey], but my national team teammate, Riikka Sallinen. She inspires me for sure, what she’s been able to do with her career, being off for so long and then coming back and being in incredible shape and being a great teammate. I think she’s definitely someone who inspires me every time I see her play or play with her. Nuutinen: My dad. When I was young, I always wanted to skate with him, and I would say he’s the most important person in my hockey career. Tuominen: I looked up to Saku Koivu, Sidney Crosby and Saara (Tuominen) Niemi, who used to play at Minnesota Duluth. And now also Emma Terho, who is part of the Olympic committee and she used to play, too. What is one place you would recommend for someone to visit in Finland? Hovi: You know what, any time if I get any visitors I want them to come to our cottage. So I would say if it’s someone that I know, they’re always welcome to visit our cottage. Because I feel like that’s the best part of Finland, if it’s the summertime in a cottage and just the sauna and a lake, it’s just the most relaxing time. I would say anywhere if you get a chance to visit a place like that, that’s what Finland’s all about. Nuutinen: Helsinki. Löyly. There is this one restaurant, you can go to the sauna there and they have good food and it’s just a really nice environment and place, and it’s really nice especially during the summer. Tuominen: That’s a tough one. Probably something from Helsinki. Well, sauna is a big part of the Finnish culture and there’s this public sauna by the ocean in Helsinki. It’s called Löyly and it’s a pretty cool piece of architecture, too, and there’s a public sauna and you can dip in the ocean, too, even in the winter so it’s a year-round place. What is one Finnish food that everyone should try? Hovi: You can usually only get it in Tampere where I’m from. It’s called the black sausage. And it looks really gross, but whoever visits from North America, I always force them to try it because it looks disgusting but it’s actually so good. So that would be like a city specialty. It is like, honestly it’s really hard to explain. I guess it’s like sort of a black sausage, like a blood sausage, so it looks different than a regular sausage. And you eat it with this lingonberry jam so it’s a really interesting mix. Nuutinen: Makaronilaatikko. It’s the most basic Finnish family meal. There is macaroni, beef, and eggs, all kind of mixed together. My family, we have five kids so it’s like food that is really easy to make, but everyone just loves it. It’s nothing fancy but it’s the most basic Finnish dish. Tuominen: Reindeer meat. I like it. I don’t get to eat it that much because I don’t make it myself, but whenever we’re somewhere that they have it there, usually I order it. Who is your favorite teammate to watch from the national team? Hovi: That’s a good one. This is an answer that it depends kind of what I’m looking for. I love watching Michelle [Karvinen] because she’s so skilled and she can make a difference against any team. So I would say her, but then honestly there’s different types of players on our team. So I could answer Sanni Hakala, our smallest player and I like watching her because she just brings 110 percent of energy every game and her speed and just how brave she is battling with the size she has. It’s incredible. So she’s really fun to watch in that way. Nuutinen: Michelle Karvinen. She is unreal with the puck, and she is such a good skater and such a good teammate. Whenever I get some shifts with her, I’m so excited. And I just love to see her playing. She sees the ice so well and she’s unreal with the puck. Tuominen: My roommate Linda Välimäki. We trust each other so much, like we talk a lot about the game and we think about the game in the same way and I feel like she never gives up on the ice, like she will keep going. She has sisu.